The year is 1987. I am 22 years old, living in Chicago and sitting in the parking lot of Second City, comedy Mecca for a midwestern gal like me. All I have to do is get out of my car and walk up to the front door and apply for a job. Simple really, and yet not. I already have a day job and I talk myself out of going inside. If I could go sit in the car with my 22-year-old self, I’d drag her through that front door today. I mean, what was I thinking? Comedy was my dream. I spent years laying on my living room floor in the 70’s, watching Saturday Night Live. 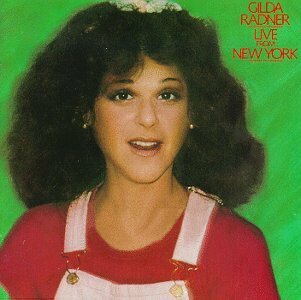 I thought Gilda Radner walked on water. I studied every nuance about her and memorized every line, every delivery, every movement. I wanted to be on Saturday Night Live more than I wanted to live. She came up through Second City in Canada, I would do it in Chicago. By 1983, I had been in a few plays, and was already studying under a professional circus clown. While most of my friends were going off to college, we couldn’t afford a university and my grades were no where close enough for a scholarship. So, I figured I’d spend a year in clown college, three years with the circus and then move to Chicago, audition for Second City, and that would be that. It’s the hard way, I wouldn’t be classically trained, but it would be worth it. Only that isn’t what happened. A kid from the wrong side of the tracks,with absolutely no self-esteem wanting to make good in this world, can sell a dream in a heart beat if the bid is right. And it was. Money, security and status pushed those dreams right out of my head, but never out of my heart. At my mother’s request I put off clown college for two years of business school. Not an unwise decision, I could always fall back on the education if I so chose. I could go to clown college after business school. Only I didn’t. Once I graduated from business school, I moved to Chicago. Clown College was quickly becoming a distant memory. Sprint Communications offered me my own data room at 22. A data room with computers the size of my refrigerator that process as much information in a week as my boy’s Ipods do in a day. I was making $19,500 in 1987, almost double what my mother made in a year. You can’t survive in Chicago on that, but I did and by 1988, I was making almost $30,000 a year. Triple what my mom used to make. That’s why I didn’t get out of my car. 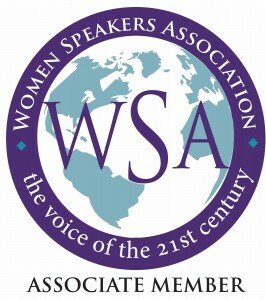 I sold my dream for an IBM mainframe and the prestige of having some feminist group put me in their who’s who of women. I was already making more money than my mother ever did. I thought for sure if I kept this up, I’d finally arrive and feel like I belong. I’d prove to the world that I was somebody. Little did I know that self-esteem cannot be bought and I already was somebody I just hadn’t met her yet. I’m kinda like that you know. I ended 2009 with a see through blouse and 50 un-mailed Christmas cards. 2010 ended about the same way when I met the Osmonds. (Trust me when I say that a white bra and a black blouse do not make for a good photo-op.) Some lessons need to be learned more than once I suppose. One lesson that does not need to be relearned is the need for personal inventories. I try to use my prayer and journal time at night to inventory my day. I look for areas I did well as well as areas of my day where I fell short of the mark. As night closes I declare my day complete and rest in God’s forgiveness. Our pastor even spoke on the need to take a personal inventory at the end of the year. Search my heart oh God and create a clean spirit within me. Why do a personal inventory, you may ask. An inventory takes stock of where we are and where we need to go. It weighs the choices of our lives, and shows us the fill marks and gaps of our spirit. A personal inventory isn’t just an accounting of good vs bad, it’s a fuel gauge for tomorrow. An inventory shows us what we need to let go of, and what we need more of in the year to come. It lightens the load making traveling easier. This is not the time to be frugal my friends. Last year’s emotional coat will not do for 2011. It’s outdated, it’s threadbare and ragged. It’s full of holes from fret, worry, and sin. It’s knees and elbows are blown clean out. We cannot travel the road ahead when we are being weighed down by the past. It isn’t even substantial enough to keep out winter’s chill. No. We need to leave the rags of this year at the feet of Christ before we can wear the glorious robes he has for us in 2011. Robes of freedom, grace, forgiveness, and mercy. He trades in our tears and our hurts for garments of praise and laughter – no matter how long it takes for them to arrive, we need to let go of our threadbare coats of yesterday. According to my sight log, people are searching for How to Let Go, How to Say I’m Sorry, and What their Identity in Christ is. Those are my top posts every year. They were important to me, which is why I wrote them, but even more so I can see they are important to others as well. Inventories teach us how to let go, when to say I’m sorry and who we are in Christ. Inventories are good things. As the year closes, I take a much larger personal inventory and again declare the year complete – clean slate, ready to start anew. I personally use an inventory system that I learned in Al-Anon many years ago. We borrow this method of personal inventories from Alcoholics Anonymous. It’s by far and large the most thorough one I’ve ever found. Food and Diet issues: This one does not have a spread sheet. I’m presently in a Bible study regarding food issues. Things I would include is frequency of exercise, diet pills, laxatives, bingeing, purging.. those sort of things. Everything I fell to this past summer. This system may be a bit much for most people, and it is one that really should be worked through with a mentor. If you’d like more information on how to do this type of personal and fearless moral inventory please see http://www.step12.com/step-4.html. I strongly suggest everyone do this kind of personal inventory at least once in their lives. It’s astounding. I offered a different type of inventory last year, one I learned from Michael Hyatt. This one is much lighter and is good as well. I’ll give you a light version of mine – I’ve left the more private details off. Growing Roots – Having moved over 20 times in my life, I often feel rootless. This year I have been able to connect with friends from back home in Redford. Having people in my life today, that I’ve known since sixth grade, is settling and freeing all at once. This is a new gift and I love it. I auditioned for my first major motion picture movie. Deleted 2010 here as those issues were forgiven and let go of. I didn’t perform live as often as I wanted because of illness. Spiritual connection. I felt dried up, even though I was studying high liturgy and other things of God, the connection with Christ just didn’t seem to be there. I spent most of 2011 in my head. What were the major life-lessons you learned this past year? Boil this down to a few short, pithy statements. Interestingly, I’m leaving some of last year’s here as well. I can make a fool out of myself and actually live to tell about it. Meeting the Osmonds in a see through blouse on accident, did not rob me of the joy of having met them finally. I’ve learned to lighten up. NEAT! People are in far more pain than I can ever imagine – especially if they are pastors. Grace for the road means a lot. Love me for a reason – is more than just a signature song. It should be a way of life. And there you have it, my personal inventory for 2011. It doesn’t really matter which method you use, there are many available. All that matters is you at least try to do one and in the end, give it over and declare the year complete. Really thankful I’m not an unwed, teenager, having divine visions, riding a donkey while in labor, looking for a safe place to have a baby who’s primary purpose in life is to die! Sheesh. That puts “holiday stress” into perspective. May we all remember the reason for the season. My friend Robbie posted this on Facebook and I LOVE it! – Merry Christmas everyone! Wednesday was our day to load up the furniture we’ve gathered for our fishing cabin and haul it out to Adair. We all worked really hard loading and unloading the moving van. I guess moving day was a little rough on the boys though. 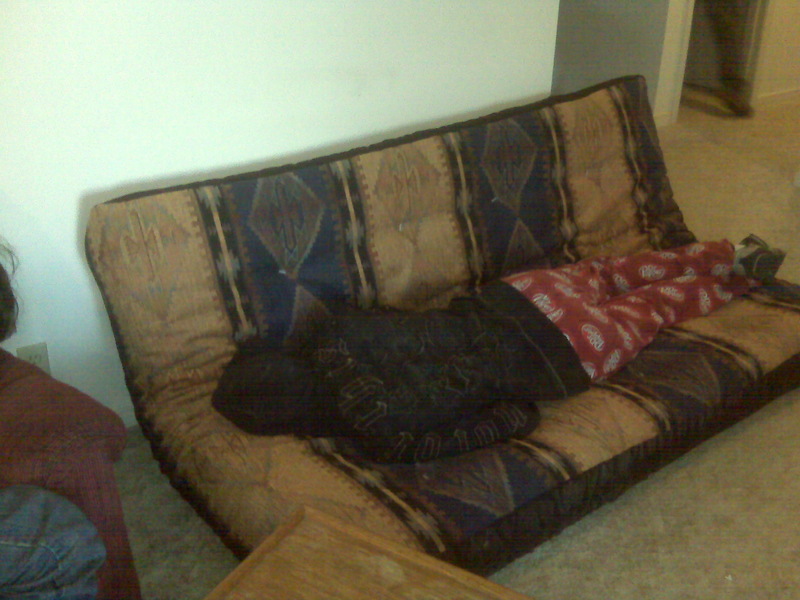 D-Man is out like a light. 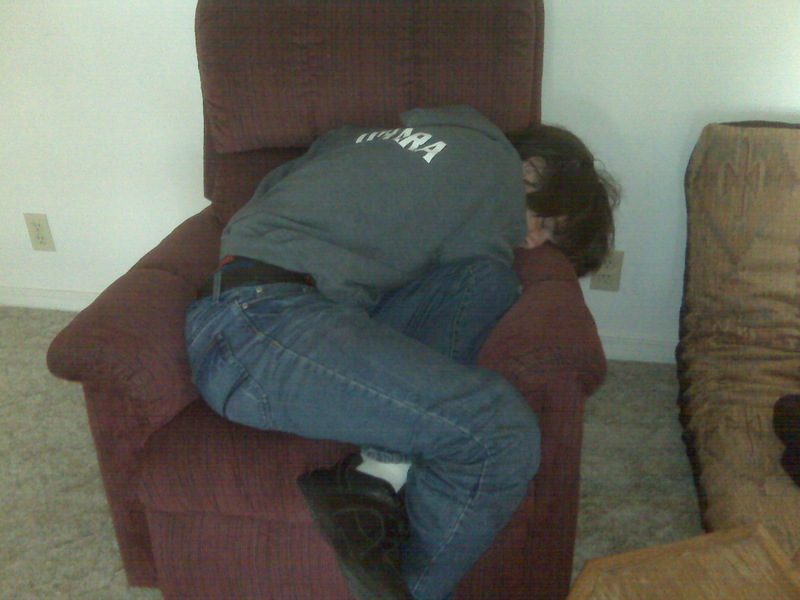 Teenagers are so cute when they are asleep you know? While researching my blog statistics to determine my top posts for 2010, I discovered that I have a rather eclectic following. Among my friends from high school, college, family, and pastors wives can be found others as well. This other category is rather eclectic. And so I would like to thank everyone who has read or commented in 2010. A tongue in cheek look if you will. Pastors & Pastor’s Wives, I appreciate you. – I really do. You guys help me stay real and hopefully I’m able to share some really cool resources as I find them. I hope anyway. You guys have the most difficult job I know. There are also the Pastor’s Watchdogs who go back and tell other pastors that I’m doing it wrong. I appreciate you as well, believe it or not. Thank you friends and family from Michigan, as well as elsewhere in the US, you know who you are and I really do appreciate you. Thank you to the Pentagon who has been on my page at least twice this year. As an only child, I’ve always wanted a big brother. Thank you Komrads from Russia – without you I would not know I need to drink more tea. Thank you Africa for your missionaries and those who wish to give me an inheritance. Thank you PX90 for telling me I need you, every day, all year-long — stop it already, you’re giving me a complex. Thank you all for telling me how I can win the lottery, bed a girl a day, lose weight, manage my money, drink tea, bet on races, move to Vegas, buy prescription drugs, and everything else a girl needs to know in this day and age. Thank you everyone who has taken time out of their day to come read what I have to say. I’m blessed humbled, and thankful for you all. Have a very blessed Christmas. It sounded like a gun shot. And then another, and another. I thought war had broken out in Tulsa. Looking out our bedroom window we can see stripped and broken trees covering our yard. My beautiful trees are no more. 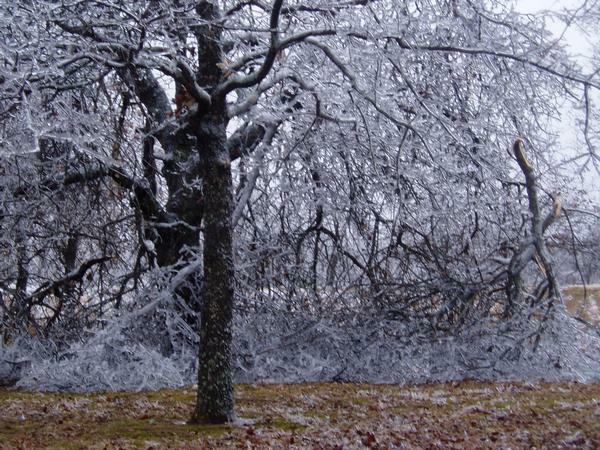 All of our trees, save one, fell victim to the ice storm of 2007. Amid the sounds of branches falling during the night, it also grew obvious to my husband and to me that our youngest son was not going to let us sleep until we rescued his rabbit. 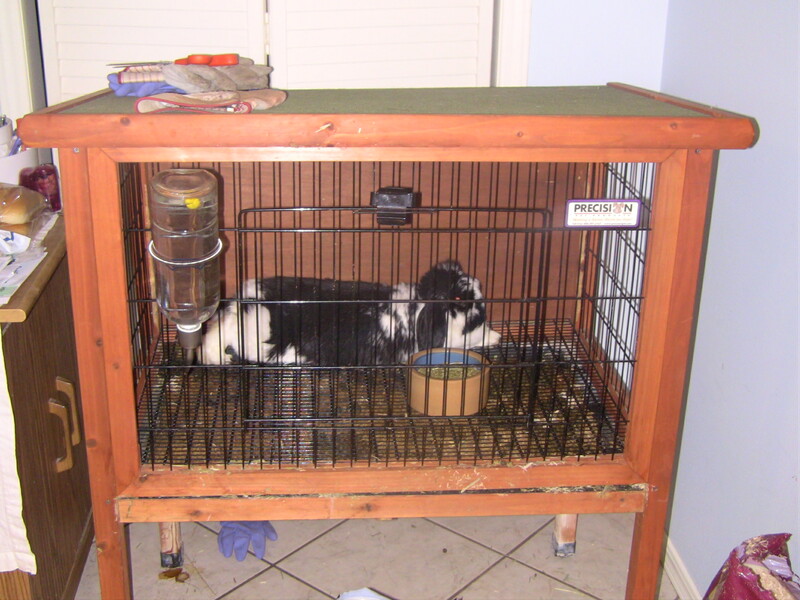 Oreo, lived in a hutch underneath what was our tall and beautiful Bradford pear in the back yard. Grabbing the foot of our bed, our son became bound and determined to rouse us into greater empathy than parents usually possess at 3 am. Empathy not forthcoming, he chose to shake our bed violently and scream until we had no choice but to either put him down, or rescue the rabbit. After some debate, we rescued the rabbit. Wearing snow boots and bathrobes, the three of us ventured out into the icy night. I carried a candle for light, while Jeff and I carefully traversed the buried yard. Stepping over branches and around others we made our way to what used to be Oreo’s dwelling. Our tree, Oreo’s shelter, was stripped back like a banana peel. Carefully moving the bent and hanging branches, we found that not one fallen branch had touched her hutch. All of the branches had created a protective cave around her home. Oreo was unharmed. It was an amazing sight. The consummate story collector, I wanted to go back for my camera but thought better of it. Instead, Jeff reached in to free a very grateful bunny and we made our way back to the house. The joy in our son’s eyes as he held his beloved pet made the whole adventure worth it. It’s cold in Tulsa right now. Temperatures are below zero at night, and we’ve once again rescued our rabbit and brought her indoors for safety. Another snow storm hit Tulsa this year and all Christmas services had been cancelled throughout the city. It just didn’t feel like Christmas without church and I missed it. Grace Lutheran was holding their Christmas Eve service on Epiphany. Grace is not our home church, but I wanted to go. I wanted to celebrate Christmas even if it was a few days late. During the service they did what they call the “Procession of the Gospel.” I don’t recall ever seeing that before. It is very high church, and not necessarily something more “modern” churches like mine do anymore. Acolytes carried the cross and candles, while the pastor came down the center aisle with the bible. This processional stopped right next to our pew. It was there that the gospel was read. Like a child, I relentlessly tugged on my husband’s sleeve asking what they were doing and why. High Liturgy is not something I’m familiar with. It was moving, and beautiful. The tears in his eyes caught me by surprise. “Immanuel. God with us.” is all he said. By coming down into the crowd, so to speak, to read the Gospel, we are reminded that God himself traveled dangerous terrain to rescue us. We are reminded that He is not some distant and untouchable figure way out there. He doesn’t need a child to shake his bed to come get us. He just did. It was dangerous and it was scandalous. And it was necessary. Comics let me hang with them because I give them material just by being present. It’s true. You can ask them. I told you I was going to see the Osmond Brothers right? I loved the show. And I didn’t cry when I met them like I was afraid I would. I still can’t believe I actually got to meet the Osmond Brothers. (Sighs, and private screams allowed) Several of us got to go back stage during intermission – I took my husband of course – and met Merrill, Wayne, and Jay Osmond. Color me happy. And more than a little nervous. Remember how I said I don’t get star struck? Well I don’t normally, but I saw Merrill and fear hit my entire body. I can only compare what happened to when we were kids and waiting in line for Santa. We were totally excited right up until it was our turn, and then fear took over. It was kind of like that. We waited in line back stage for our chance to meet the brothers and suddenly it was my turn. I took one look and Merrill and BAM, my heart dropped into my stomach and my feet felt like lead. I grabbed my husband and made him come with me so that he could remind me my name if needed. Which is good because I forgot it. Not only am I a walking catastrophe, I’m apparently a dork. Jay Osmond is warm and funny and snapped me out of it, but still. I froze like I’ve never frozen before. I’m amazed I even had the wherewithal to remember I was married and to whom. Going back stage was a huge treat. It was wonderful. And I didn’t cry until.. I got my picture back. You know that really pretty black blouse I bought? I was rushed when I got ready and forgot to change bras. They all look great. I look like I leaned over a table of powdered donuts. And no. You can’t see it. That is one photograph that even Photoshop can’t help (I know because I tried) and I do not wish to wind up on Ellen DeGeneres’ hall of shame. The show itself was very sweet. Three of the original four, Merrill, Wayne, and Jay performed and they did a great job singing Christmas songs as well as songs from the years passed, including He Ain’t Heavy, Yo Yo, Love Me for a Reason and many more. My heart absolutely soared. In case you are wondering, Jim Osmond does perform with them from time to time and he is in England right now doing a play. (Yes, I still remember all of the words from Long Haired Lover from Liverpool.) Donny and Marie are on Broadway and Alan retired last year because of MS. And did you know that Wayne had a brain tumor 19 years ago and is a cancer survivor? I didn’t. Amazing. The three brothers (and their back up) did a wonderful job and as nice as it would have been to see the whole family again, I didn’t miss them not being there. The harmonies, the banter and the memories were relaxed and as comfortable as home. Jay can still play a mean drum solo, Merrill is as charming and handsome as ever and Wayne? Let’s just say he reminds me of that uncle everyone has, but no one talks about. His jokes and comedic timing were absolutely splendid. My husband cannot get over some of those jokes. They were that good. It’s fun seeing a group of musicians, most my own age or older, who still have that natural talent, strong work ethic, and great sense of humor work together with such ease and comfort. All those years of hard work still shines through in their performing. They are timeless. Will I see them again? Oh yeah. The show was wonderful and besides, I need a redemptive photographic do over that doesn’t come with a wardrobe malfunction. I’m claiming female prerogative on that one. Seriously if you saw the picture, you would totally understand.